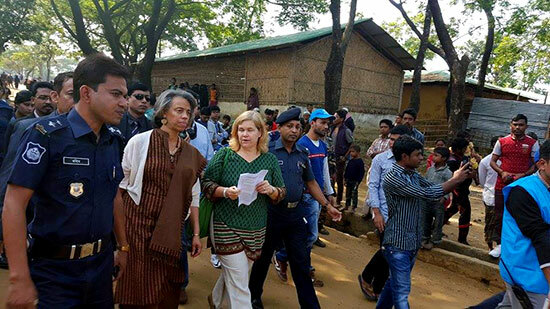 Ukhiya, Bangladesh: US Ambassador Ms. Marcia Bernicat along with other high level officers visited the Kutupalong official and unofficial camps on December 22 and observed the situation of the refugees, a refugee leader Jalal Uddin from the Kutupalong camp said. The team reached at Kutupalong refugee camps, at around 9:30 am, he said. After arriving the camp, they visited the refugee schools, Handicap Center, MSF (Holland) hospital and ACF center, according to refugees’ committee from the camp. They held meeting with refugees including refugee committee members at community center and discussed about different issues of Rohingya refugees regarding— living standard, medical facilitates, durable solution, higher education and etc., refugees’ committee further said. 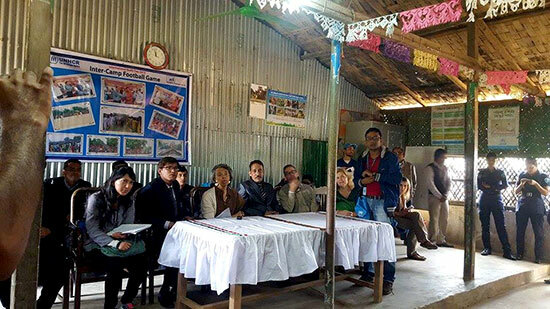 However, the officers of RRRC, UNHCR, NGOs, and Camp in-Charge Mahamudul Haque, and Ukhyia police officer participated during the meeting, the committee more said. The US envoy, Marcia Bernicat – who was on a visit to Cox’s Bazar on December 21 and 22, met district and local officials, registered as well as undocumented Rohingya refugees, and organizations providing humanitarian assistance in the area – reiterated the US commitment to helping Bangladesh, Burma, and countries across the region “find just and durable solutions for the Rohingya and to providing protection and assistance to Rohingya refugees, asylum seekers and their host communities”, according to the embassy statement. The US has ‘steadily’ talked to Myanmar authorities on the issue and they will continue to do so, said the US envoy Marcia Bernicat. “Everyone I met in Cox’s Bazar on December 22, I made that point…Rohingyas should be able to go home with safety to carry out their livelihoods,” the US envoy Marcia Bernicat, said appreciating Bangladesh’s efforts. This entry was posted in English, News and tagged Arakan, Bangladesh, Rakhine, refugee camp. Kutupalong, Rohingya, US envoy. Bookmark the permalink.